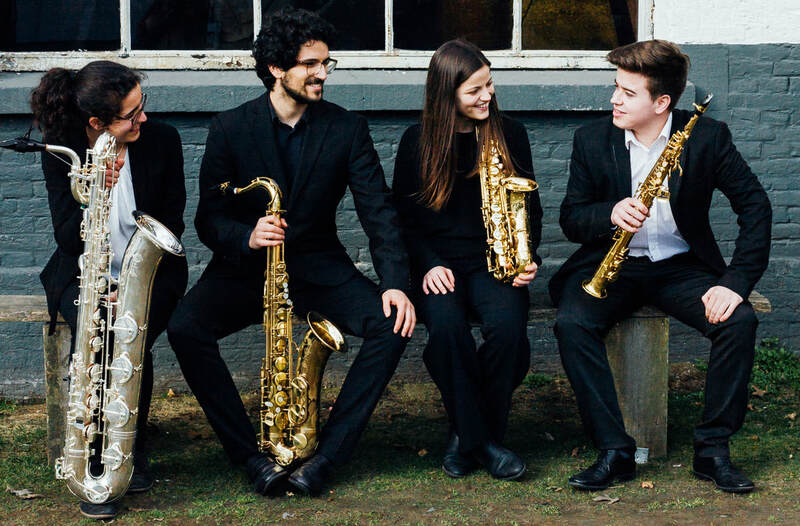 MAAT Saxophone Quartet is a young, fresh and ambitious ensemble founded in 2017 between Amsterdam and Tilburg, Netherlands. Already performed at Willem Twee Toonzaal in –s’Hertogenbosch, Cenakel in Tilburg and Blue Note Amsterdam, the quartet combines four outstanding musicians, all from Portugal, and was born from the great desire and passion of making music together. They are students from the saxophone class of Henk van Twillert and Fernando Ramos, at ESMAE (Escola Superior de Música e Artes do Espectáculo), class of Arno Bornkamp, at Conservatorium van Amsterdam and from the saxophone class of Ties Mellema, at Fontys Hogeschool voor de Kunsten in Tilburg. The quartet has guidance from Arno Bornkamp, Ties Mellema, Léon Beréndse and Sven Arne Tepl. In 2018 they are one of the finalists at the “Willem Twee Chamber Music Competition”, at the Willem Twee Toonzaal in –s’Hertogenbosch. The quartet works regularly with new and young composers, promoting the development of new saxophone quartet repertoire, as well as the development of the new pieces for this formation by Portuguese composers, such as Nuno Lobo. MAAT Saxophone Quartet, combining four musicians from the same country, has the desire to bring abroad and develop the great music it is found in Portugal, as well as bring with them the great music it is found in the Netherlands, making this artistic and cultural connection through the music.